The CE mark is proof of conformity with the respective EU directives. Only when they have it may manufacturers put their products on the market within the European Union. The CE mark is a legal mark and not a seal of quality. The CE mark is always applied by the manufacturer/distributor themselves and the correct application is the manufacturer’s responsibility. Some EC directives require, however, the completion of a certification of conformity procedure. That includes, for example, the Construction Products Directive (CPD) which defines the essential safety and security standards for building materials – also in connection with fire protection systems in buildings. For fire protection products, including Fire Suppression Systems the European Commission has issued a uniform conformity proof method (so-called system 1). In this procedure, a testing, supervisory and certification body recognized by the building authorities (Notified Body) must be called upon. 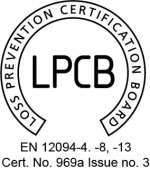 LPCB is a Notified Body in accordance with the CPD. Safety Hi-Tech’s components listed by LPCB have been assessed and tested to the EN 12094 series of standard and the production facilities have been assessed to ensure that the components meet and continue to meet these standards. In order to maintain approval these facilities are re-inspected yearly and the components examined and tested as necessary. The technical specifications for fire protection products are, as a rule, harmonized European norms (hEN) which are developed by CEN and are anchored in a so-called harmonization process as a basis for the CE marking. The Construction Products Regulation (CPR) has been adopted by the European Commission and replaces the Construction Products Directive (CPD). It is now mandatory for products which fall under the scope of the regulation to have CE Marking. Any manufacture or importer of products that are within the scope of the Regulation, is required to declare that the product complies with the Regulation and display the CE mark, before it can be sold in Europe. On February 21st, the Official Journal of the European Union published the Commission Delegated Regulation (EU) No. 157/2014 of 30th October 2013 on the condition for making a Declaration of Performance on construction products available on a website. According to the regulation, Economic operators may make available a declaration of performance on a website, provided that the comply all of the following conditions. 1) They shall ensure that the content of a declaration of performance is not altered after it has been made available on the website. 2) They shall ensure that the website where the declarations of performance drawn up for construction products have been made available is monitored and maintained so that the website and the declarations of performance are continuously available to recipients of construction products. 3) They shall ensure that the declaration of performance may be accessed by the recipients of construction products free of charge for a period of 10 years after the construction product has been placed on the market, or for such other period that may be applicable in accordance with the second subparagraph of Article 11(2) of Regulation (EU) No 305/2011. 4) They shall provide instructions to the recipients of construction products on how to access the website and the declarations of performance drawn up for such products available on that website.